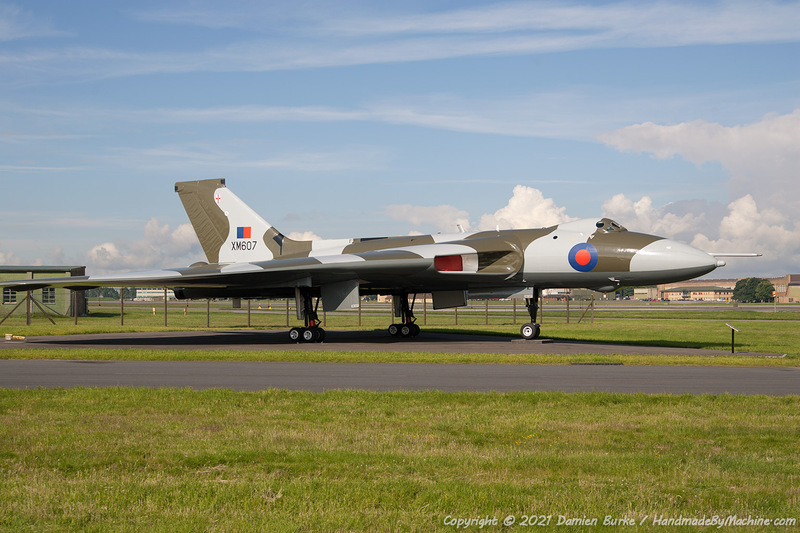 Another Vulcan currently in good exterior condition is XM607, the gate guardian at RAF Waddington. A Black Buck veteran, XM607 has been well looked-after by the RAF and over the years has acted as a spares ship for more lively Vulcans. The undercarriage bays are sealed with wooden planks and the cockpit entrance hatch was seized shut for many years so the cockpit was very complete until fairly recently, when the hatch was finally freed. Since then and with the requirement for a new building at her old spot near the entrance to the station, she has been moved around a fair bit (handy for the annual airshow, where she could usually be found on display by one of the hangars), and now has a 'final' resting place on a purpose built hardstanding opposite the WAVE viewing area on the A15 side of the station. XM607, in common with several other Vulcans, donated many parts towards the restoration of XH558. She has been immortalised in an excellent book titled 'Vulcan 607' - well worth a read!